As the name states, the Final Boss is the last major challenge in many video games. They will usually be much harder to defeat than all of the enemies the player has faced thus far (as always, there are exceptions), and will be prone to making a suitably grand entrance for their stature. These may also be known as "the Boss of the Game". Usually resides within The Very Definitely Final Dungeon, and is the Big Bad or Bigger Bad of the game's general storyline—though there are occasional aversions, and sometimes you may find yourself facing a final challenge against someone for the sake of the challenge rather than because they Must Be Stopped. When they're evil, they usually have multiple forms that must all be defeated back-to-back to complete the game. If the game uses the same boss music throughout the game (a lot more common in earlier games), expect this boss to get its own theme. It is sometimes a Load-Bearing Boss, so even after defeating it, there will be one final challenge to escape its collapsing lair (or part of the ending cutscene will depict the heroes escaping the lair, if you don't get to play that part yourself). See Giant Space Flea From Nowhere when the Final Boss seems to have nothing to do with the events leading up to it. If they show up earlier in the game just to beat up the heroes, it's a Final Boss Preview. If the Final Boss is considered the last "normal" enemy, but you did so well that another boss appears out of nowhere, the replacement is called True Final Boss instead. May make future appearances if Promoted to Unlockable. Being a near-ubiquitous trope in video games, a list of specific examples is unnecessary - almost every game with Boss Battles has one that takes place just before the ending of the game, and that's the Final Boss. Note that the Final Boss isn't necessarily the hardest; even if it's not a pushover, there may be a really hard boss earlier on, and Bonus Bosses are usually around to give Challenge Gamers a tougher fight than is needed to finish the game. More interesting forms of this trope are under different pages. Also, the final boss need not be the very last thing you fight. Sometimes, a post-climax finisher fight occurs; less difficult, or smaller stakes than before, meant to tie up loose ends; we like to call that a Post Final Boss. 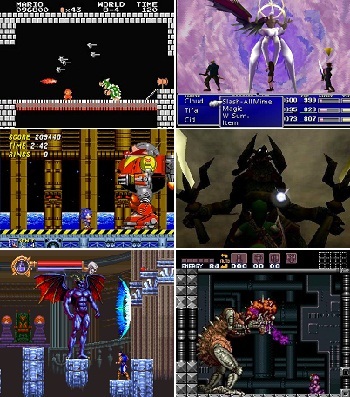 ↑ Clockwise from top-left: Bowser, Sephiroth, Ganon, Mother Brain, Dracula, Robotnik. ↑ Actually, he's a Bonus Boss, but he cannot be fought before the game's actual final boss.